Lime, or calcium oxide (CaO), is derived through the decarbonation of limestone. The primary product of limestone decarbonation is called quicklime; it can be hydrated to form hydrated lime or calcium hydroxide (Ca[OH]2). Quicklime is used primarily in metallurgy (steel) and flue gas desulfurization, while hydrated lime (also known as slaked lime) is used in construction (soil stabilization) and water treatment. Limestone, a sedimentary rock composed mainly of calcium carbonate (CaCO3), is the precursor in the manufacture of lime and precipitated calcium carbonate, and is an important raw material with a wide range of applications; its primary use is in the construction industry, where it is the principal source of crushed rock aggregate. It is also an essential raw material for cement manufacture, and a source of building stone. The production of lime increased strongly during 2008-14, spurred by recovery following the economic downturn, but has been relatively stable in the last four years, as many markets follow GDP and overall growth in China has slowed. 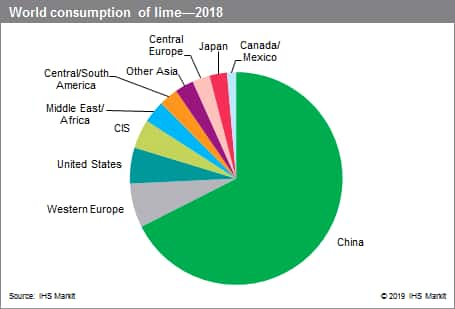 Even so, China continues to lead the production and consumption of lime, and will remain the fastest-growing region during the forecast period. In developed regions, such as North America, Western Europe, and Japan, production of lime is a mature industry characterized by consolidation among regional producers, each servicing its regional markets. The major use for lime is in metallurgy, primarily in steel production as a flux to remove phosphorus, sulfur, silica, and manganese from the molten steel. Lime is also used in aluminum and magnesium metal production and in the processing of other metal ores (copper, gold, nickel, zinc, cobalt, and lead). Soil stabilization is the primary use for lime in construction; other construction markets include asphalt, mason’s lime used in mortars and concrete, and finishing lime for plasters. Environmental uses, including flue gas desulfurization, potable water treatment, and wastewater treatment, are expected to be some of the fastest-growing applications through the forecast period. The majority of the remaining consumption is for various chemical and industrial uses, such as production of precipitated calcium carbonate 2PCC3, aluminum oxide, calcium carbide, and soda ash; use in sugar refining, glassmaking, and leather tanning; and direct use in agriculture to neutralize acid soils and provide essential nutrients. There is relatively very little trade worldwide, primarily because lime is readily available in all parts of the world and transportation costs can account for a significant portion of the product value. The two largest producers of lime with a worldwide presence are the Lhoist Group and the Carmeuse Group, both headquartered in Belgium. However, there are also local producers with large capacities, serving the local markets in metallurgy, construction, chemicals, and agriculture. Some large consumers in these industries have substantial capacities to cover their internal needs. Overall consumption is forecast to grow at about 2% annually during 2018-23, led by the largest market, China, at about 2.5% annually. The fastest-growing markets are expected to be metallurgy at over 3% per year, driven by increasing steel production, and chemical and industrial uses.